Perform learning value reset and idle learning after replacing or servicing parts related to engine operation. Details on procedures required are indicated by an asterisk and a number, and are explained in detail following the table. Perform learning value reset and idle learning when one or more of the following conditions is met. A DTC was output before component replacement. An air fuel ratio learned value (one of A/F Learn Value Idle #1, A/F Learn Value Low #1, A/F Learn Value Mid1 #1, A/F Learn Value Mid2 #1, and A/F Learn Value High #1) displayed in the Data List was higher than +/- 15% before component replacement. Starting failure, rough idle, or engine stalls after component replacement. The items in the list above do not apply. Engine learned values cannot be reset by disconnecting the battery negative (-) terminal or removing the EFI NO. 1 and ETCS fuses. Enter the following menus: Powertrain / Engine / Utility / Learning Value Reset. Confirm the following conditions as instructed on the screen. After confirming, select "Next" and initialize the learned value. After the completion of learned value initialization, confirm the air fuel ratio learned values (A/F Learn Value Idle #1, A/F Learn Value Low #1, A/F Learn Value Mid1 #1, A/F Learn Value Mid2 #1, and A/F Learn Value High #1) in the Data List. If 0 is displayed for all the air fuel ratio learned values, initialization has completed correctly. If a value other than 0 is displayed for one of the air fuel ratio learned values, perform initialization again. After initialization, confirm the air fuel ratio learned values. If a value other than 0 is displayed, replace the ECM. Start the engine and warm it up until the engine coolant temperature is 80°C (176°F) or higher. Learning starts when the engine coolant temperature is 80°C (176°F) or higher. After the engine is warmed up, allow it to idle for 5 minutes with the air conditioning and all accessories off. Confirm that the idle speed is within the standard range. Make sure that the shift lever is in P or N.
*3: Perform memory reset and idle learning after replacing the throttle body or cleaning deposits from the throttle body. After that, check the idle speed. If the value is out of the specified range, perform the procedure below. History information for driving and stopping is necessary to update idle learning. Warm up the engine (engine coolant temperature is 80°C (176°F) or higher, air conditioning and all accessories are off) [A]. Drive the vehicle at 10 km/h (6 mph) or more [B]. Idle the engine for 20 seconds or more [C]. 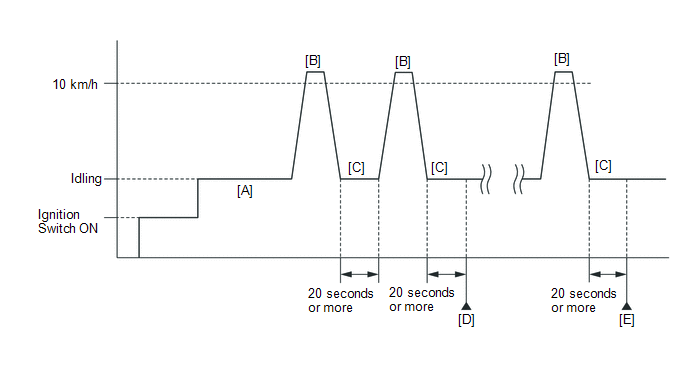 Repeat procedure [B] and [C], and check that the idle speed is within the specified range [D]. If the idle speed is still out of the specified range, repeat procedure [B] and [C] until the idle speed is within the specified range [E]. *4: Drive the vehicle for a short while after replacing the knock control sensor, and check if knocking occurs. If knocking occurs, drive the vehicle until knocking stops.